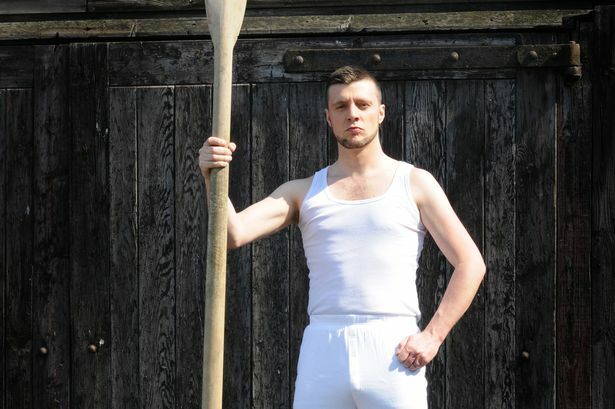 He’s all but forgotten now – well, he was until North East playwright Ed Waugh got to work on him, bringing Harry Clasper, champion oarsman, back to life as an inspiring (and perspiring) role model. This I am quite prepared to believe, having sat through Hadaway Harry and felt as if I had rowed every nautical foot of his epic, world championship-winning row against the men of the Thames. A victory for Tyneside in the days of steam – and paddle power! This is a one-man play. Well, one man and a supporting cast of puppets. One man wrote it (Waugh), one man directed it (Russell Floyd) and one man simply is Harry Clasper. A wonderful performance from Gateshead-born actor Jamie Brown evokes the grit and determination of a one-time North East pitman whose rowing exploits drew many thousands to the banks of our great rivers – Tyne, Thames, Wear, Mersey. This was back in the 1860s, long before Newcastle United – as Clasper as narrator tells us – “was but a twinkle in Mike Ashley’s eye”. There were 20 rowing clubs on the Tyne alone. Big races attracted big betting. Clasper, aided by his equally accomplished brothers, took to it like a duck to... you know what! Jamie Brown, as Clasper, tells the story – with the humour you would expect from an Ed Waugh drama – and enacts it. The first half is mostly scene-setting, conjuring up the time of the Industrial Revolution when the masses sought recreation after long hours of toil. A screen on stage aids the process. Clasper, born into a big family, married his cousin, a relatively well-off girl, and they started to build another big family. Clasper, not just a champion rower but an innovative boat builder whose designs are still seen today, fathered children and worked on the vessel that could beat his cockney nemesis. The arrival of bairns and skiffs punctuate the first-half action. Most of the second half is given over to the big race on the Thames when, due to the sudden and unexpected death of Harry’s younger brother Edward, old Uncle Ned (he was 42 – old for the time) was roped in to fill the vacant seat. In a virtuoso performance, Brown’s Clasper rows and commentates, never ‘catching a crab’ either physically or vocally. It was a wonder to me that the actor (who actually doesn’t have boat or oar) had the strength to acknowledge the loud applause at the end. Brown, straight-backed and square-jawed, is making something of a habit of playing North East heroes. Recently he was on stage in South Shields as John Simpson Kirkpatrick, the ‘man with the donkey’ whose life-saving exploits made him a Gallipoli hero. You can see Hadaway Harry at the Discovery Museum, Newcastle, today (Wednesday, July 8) at 7.30pm and on Thursday, July 9, at 2.30pm and 7.30pm.